Mike Vince, who many will recognise as the former Managing Director of Innovation Finance, has launched his own business - MRVince Limited. 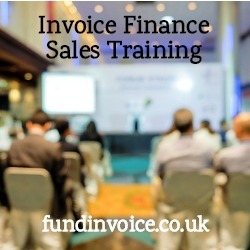 The business will provide sales training to the Business Development Managers within invoice finance companies. He has been a top performing sales person in his own right, as well as being a great sales team manager and a first class presenter. Mike is offering a FREE initial consultation visit. Mike has worked within the sector for over 30 years, and we first met when we he joined Barclays Commercial Services from International Factors. He has since gone on to work at Close Invoice Finance and Nucleus Commercial Finance before taking over at Innovation. There is always demand for good quality sales people (normally called Business Development Managers - BDMs) within the invoice finance sector. Based on this demand, Mike identified a need to access, develop and train BDMs for the sector. To this end he is launching his own training company to meet this need, delivering one-to-one mentoring, workshops and training sessions. His service if very much bespoke and tailored to the needs of the organisation, rather than a standard offering. It starts with a free consultation visit, to discuss what you need and assess how both parties could work together, fitting with any existing training programmes. I would not hesitate to recommend Mike's services to any invoice finance company that is looking to develop their sales team.